Get 10% Off Your Next Order ! FRED BIRD & COMPANY in Cottonwood, California, knows that if you have a happy bird while maintaining your bird's safety then we will have a happy customer. Our harness has previously been featured in the Pet Bird Report and Bird Talk Magazine almost 27 years ago. FRED BIRD & COMPANY was the original bird harness, developed almost 27 years ago allowing parrots to fly, while maintaining safety and with six-foot leash allowed the bird to stay next to you and an up to 100 feet of leash for flying. (Some clients have even used kite reels for extended distance.) Protect your bird outdoors, allowing it to be comfortable and free. 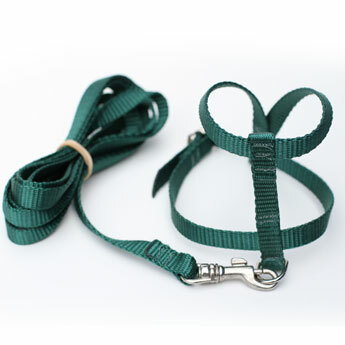 Complete supervision is recommended when using this harness. Due to disease control regulations, products cannot be returned. Try our harness for safe handling and bonding. Our product is not intended to be used for discipline or restraint purposes. If your bird is not easy to handle, our product may not be the right fit for you. A lot of careful planning and research over a 27-year period went into the design of our bird harness. We have found that some birds have taken off or destroyed the snap within seconds, while other birds could care less and feel comfortable in it. You should be able to gauge what works best for both you and your bird. Safety is the key to using our product. A proper fit ensures comfort and safety. We have a sizing chart available so you can determine what size should fit your beloved friend. If we need to custom make a new head loop for your bird, we can do this at no extra charge.